Perfect for group and family! The house has both old atmosphere and modern facilities. You can easily find convenience store, bakery, grocery shops, restaurants ans so on.. This house is off the main street, its outskirts is silent but you will find anything you want. It is also convenient to do some sightseeing. 10 minutes to subway Karasuma-Oike station, only three stops from main Kyoto station. You can go these spots within 30 min by train. In Summer, Gion festival, it is a traditional festival, is held near the property. You can see a parade float on the road. There are two tatami mats rooms where to sleep with futons, one twin bedroom western style living room with table, chairs, sofa, modern kitchen. 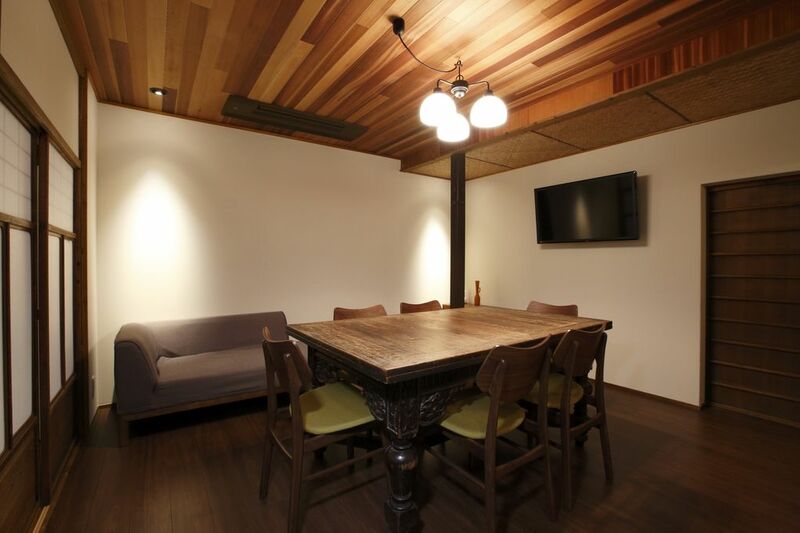 This property KAEDE is the lower unit of a two-storied Machiya townhouse. There is another unit on the second floor and will be used by other guest. However you will not share any room except the main entrance hall. It is required to stay more than 2 days. If you are interested in the upper unit which is smaller and reasonable than this unit, please take a look at the property #1077956. Hello, everyone! We are 4 girls who live in Kyoto and Osaka! Shiho: I was a professional skier in Japan and Canada. I love playing all kinds of sports and drinking with girls' friend. We sometimes go to have dinner together. On my day off, I travel and explore in Kyoto. Jacky:I have been to Australia, New Zealand and Hawaii. I stadied English in Australia, so my accennt is a little bit Aussie accent. I love traveling, reading books, comics, watching animation of Ghibli,talking with my guests and sharing my life in Kyoto.. Mia: I LOVE traveling, have been to over 10 countries and many places in Japan :) I also like walking along the river and relaxing on my day off. I'm looking forward to meeting you in Kyoto! Please feel free to contact us anytime! This house is almost 100 years old. We would like to leave this traditional house to posterity. We renovated the inside of the house but the outside, you can see the old Japanese style. There is a small garden and veranda. The veranda is connected to a detached room. You can see the morning in fresh air and in the night, the garden is lighted up dreamy. We provide floor heating and air conditioner (hot/cold) You spend your vacation comfortably. You can use the house phone when you call us. Wide kitchen is in kitchen area. This machiya was very nicely done, comfortable, and in a convenient location. We felt like we were living versus visiting in Kyoto. The machiya has quality materials and construction throughout. For instance, the flooring is heated and the kitchen cabinets were high grade. The garden was soothing. I would stay here again. You will find easily restaurants. bakery, convenience store and grocery.